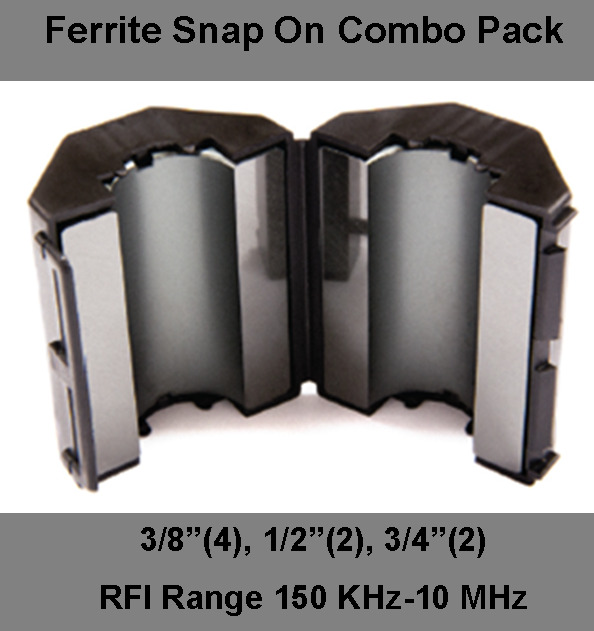 The Ferrite Snap On Combo Pack is a convenient solution for troubleshooting RFI/EMI with various diameter cables ranging from 1/4″ to 3/4″ for use as either single turn or multiple turn ferrite chokes. The snap on chokes are useful for RF coax, AC/DC power cables, and device interconnection cables. Normal Retail price is $140 for these parts individually - this items qualifies your USA order for free shipping. Excellent for AC/DC power cables on switching power supplies and data/audio/video cables for AM broadcast RFI suppression.